This app allows the professional service providers to find the Job by creating the desired estimation and then offer services to the client. There is no need for the professional to rush to the market and offer their services. They are notified about the Job and they can submit the estimation and start the work. 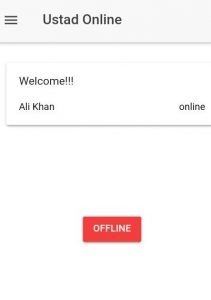 For signing in to the application, enter the username and password in the Login page and hit the Login button, if credentials are valid Dashboard is shown. 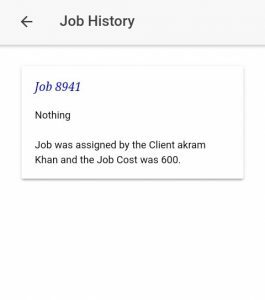 When user clicks My Job from menu all of the professional Jobs appear and user can view the Job details that are assigned to the professional and can view the Job status. User can view the complete Job detail by pressing against the new Job notification. It shows all the Job details along with the attachments like photos, audio and videos These attachments will help the professional to understand the Job nature and create the estimation. He can visit job, cancel the Job and contact client. 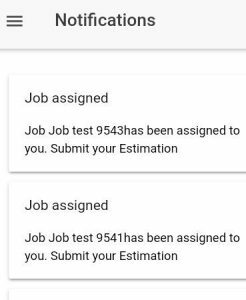 Once the job is approved a notification is sent to the professional and upon clicking the notification it shows the Job details. Visit button if user hits the button, a screen is shown to the user with the map to direct the professional about the client location and directions. Note: GPS must be enabled for locating the client. 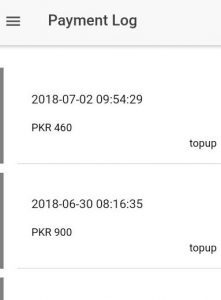 Once the job is assigned to the Professional a notification is sent to the professional and upon clicking the notification it will show the Job details and Cancel button to cancel the Job. User can cancel the Job at any time even if the job is in progress. 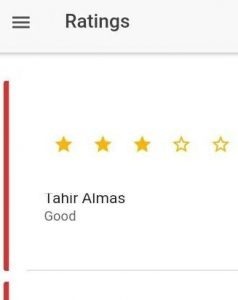 When user clicks the Ratings menu professional ratings against all the jobs appear. 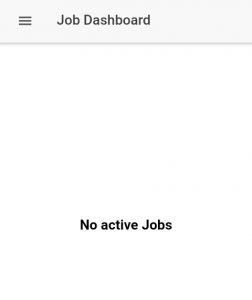 User currently active Jobs are shown in the Job Dashboard. 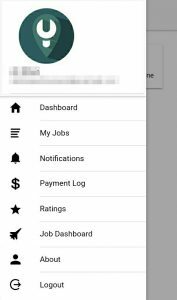 User current Job status and the time spent is shown in the Job Dashboard, user can add the balance through the Job dashboard and update the Job status moreover user can also cancel the Job. User can also manage his account, view or update the account details by selecting the About menu from the sidebar. It will open the user account. 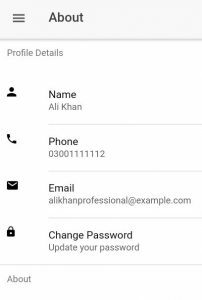 User can see his account details and can also modify those details if user wishes to modify. To logout from the app simply select the logout menu from the sidebar. A prompt is shown to the user,click the ‘Yes’ button to sign out of app you are logged into.